What’s the Best Withdrawal Strategy? Experts have long advised retirees to withdraw 4 percent of their nest egg in the first year of retirement and then adjust that amount for inflation each year thereafter. But is that the best approach for everyone? Newer research has found that the 4 percent rule might be too conservative for some and too aggressive for others. It’s also highly dependent on a host of outside factors, such as market performance, personal expenses (such as health care costs), and more. For example, retirement expert Michael Kitces recently found that, two-thirds of the time, retirees who followed the 4 percent rule with a 60 percent stocks/40 percent bonds portfolio finished with more than double their starting principal after 30 years. While extra money isn’t necessarily a bad thing, it means many retirees could be spending more freely on the things they enjoy. On the other hand, lack of savings and market downturns, like the Great Recession, could make a 4 percent withdrawal rate unsustainable for many. Longevity is also a wild card. As life spans continue to increase—the average 65-year-old American will live at least another 20 years; many will live much longer than that—more money is needed to fund those extra years. Stay flexible. Start at a 3 percent or 4 percent withdrawal rate and then adjust accordingly. If the market doesn’t do well, you may need to start taking out less. If it does well, you may be able to afford a higher withdrawal rate for a time. Consider your resources. If you have a wide range of retirement income sources to draw from—a 401(k), a pension, and Social Security benefits, for example—you have more freedom to withdraw a bit more. Look for guaranteed income. For some retirees, an annuity can provide a steady stream of income over a guaranteed number of years, taking the guess work out of much of the process. 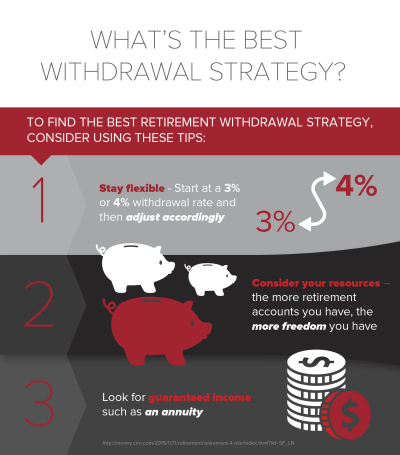 Most experts agree: there’s no one-size-fits-all withdrawal strategy for retirement. For most, the best approach is to pay attention and make regular adjustments, as needed.